How can you store lots of sheet music? A music folio cabinet has plenty of room for all of your concertos and symphonies. This is the perfect solution for a school band or orchestra that has lots of pieces which need to stay organized. Smart designs and a selection of sizes make Hertz Furniture’s music filing systems an excellent option for ensembles of any size. Whether you prefer locked filing or open shelving, we have a sheet music storage solution that will fit the bill. You can organize music by piece, instrument or composer, or any other system that makes sense to you. With great features and attractive functional designs, our music folio cabinets will save any band leader time, space and frustration. What is the most efficient way to store sheet music? A music folio cabinet allows you to maximize space and organization in your sheet music storage. With multiple tiers designed for easy filing, finding a proper place for each piece is no big deal. You can organize alphabetically by composer, instrument or however you want. When you are working with multiple musicians and instruments over the course of many years, a reliable filing system is essential to keeping each player on the right page. What is a rotary music filing system? If you are concerned about space planning in a practice space or band room, a rotary music filing system is an ideal option. The convenient design provides double the amount of storage while offering easy access to both sides. All you have to do is unlock the cabinet and swing to the side you need. With no doors, you don’t need to worry about people bumping into the open cabinet and you don’t need to keep so much clear space in front of it to provide access. When it comes to music folio cabinets, getting to what you need quickly makes all the difference. You don’t want to waste precious practice time hunting down the right papers, so it’s worth making sure things are organized from the beginning. Adjustable high-capacity shelves provide a perfect fit. This modular system comes in a choice of sizes so you can get a custom fit for the space you have. How do you organize a music folio cabinet? 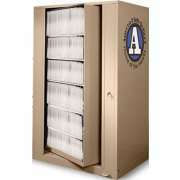 Open music folio storage includes either 72 or 48 individual compartments which can be organized in a number of ways. If you have a large school band, it might be a good idea to assign a compartment to each student musician. Another option is to organize by instrument, level of difficulty or piece. You can even make a custom order to get the exact number of compartments you want. These sheet music cabinets have casters for easy transport from storage to band room to rehearsal space and back.